What is commonly referred to as “Mag Bay” is a stretch of pacific coastline measuring about 50 km located less than a quarter of the way up the Baja Peninsula north of Los Cabos. The bay is created by the protective uninhabited sandy barrier islands of Isla Magdalena and Isla Santa Margarita. Our destination was the tiny town of Puerto López Mateo, which sits on the northern end of the bay and is about half the size of its sister town of Puerto San Carlos to the south. We arrived in town right at sunset and, as advertised, we found the town to be simple and the accommodations to be sparse yet comfortable. A hearty dinner of local seafood lead to some time around the fire pit. Just over our conversation we could hear the din of live music and revelry coming from an undefined direction. Just loud enough to spike our curiosities but not enough to deter us from heading to bed in anticipation of an early start. The morning arrived foggy and cold and we followed the hotel staff’s instructions to just continue a little further down the road to find the jumping off point for the days adventure. We found a massive parking lot and a decent sized plaza where the various outfitters were setting up their booths for the day. Behind them lay a small marina accommodating about 40 pangas, all in good shape with modern outboard engines. The plaza was spotless and dotted with small stores and vendors. A large stage and neatly stacked cases of beer revealed the location of the previous night’s festivities and also conveyed the feeling that the annual visit by the whales was worthy of a celebration and a source of great civic pride. I made a mental note to not ignore the nighttime festivities on my next trip. We quickly found the outfitter and guide that came on a friend’s recommendation and made our way down to the docks. 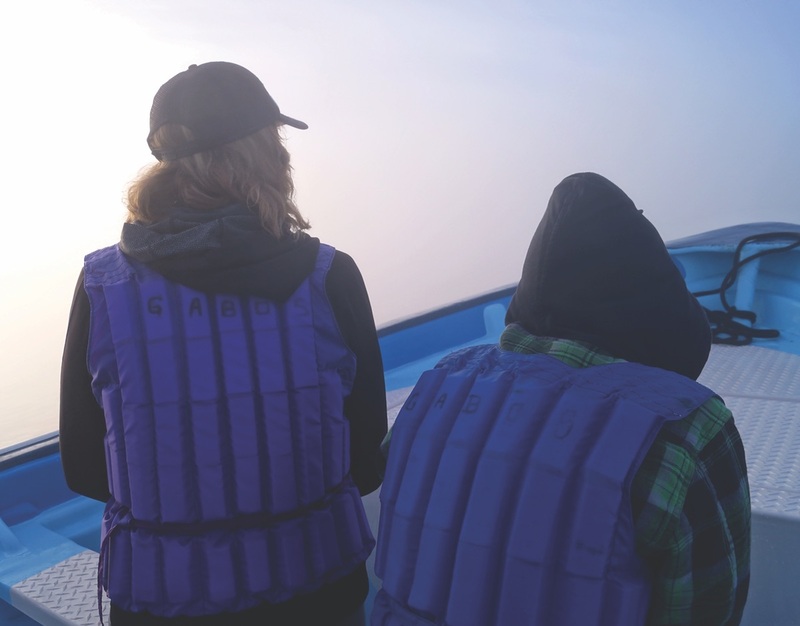 We set out in our panga with the fog limiting our vision and putting a chill into my bones that I had yet to feel during my ten years living in Mexico. Within moments of leaving the dock we can both hear and see several adult whales around us. Human heads spinning to see dark shapes coming from the water and the audible “pfuuuush” of their powerful exhales that echo in over the hum of the outboard engine. To my surprise, the guide carries on deeper into the fog. But, but, but… why aren’t we stopping to see the whales? I drove all day, slept on a lumpy bed, awoke before dawn and am dressed for a day of skiing…The whales are right here, where are we going? Are there, like…better whales? These ones look perfectly fine to me? The panga sped up. The fog got thicker. The styrofoam coffee cup in my hand had been bled of its warming powers and we soldiered on in search of “better whales”. The landscape around Mag Bay bears little resemblance to more familiar parts of the Baja. The land is flat with lush mangrove coming right down to the water’s edge, thin strands of beach appear scattered about. It feels more “Florida Bayou” than Baja whale haven and we weave through channels and bays never too far from the shore on either side. An occasional fisherman is seen tending to his nets and birds take flight as we buzz through their morning peace. Still present is the occasional “pfuuuush” and a dark figure in the water but we have now learned they are not the “better whales” so we pay them little notice. We slow down and, almost as if by design, patches of clear sky appear and we realize we are at the junction of a few bays that create what seems like an inland lake. Perhaps a few miles across and we can see several other boats scattered about the “lake”. More importantly the clearing fog reveals what we have been looking for. “Thar be better whales!” our guide bellows. OK, not really, but that’s what he should have said as we were now obviously getting to the good part. The glassy waters make them much easier to spot and our guide pulls ahead of a slow-moving pod and waits for them to approach. Maybe it is the calmness and clarity of the water or the lack of other boat traffic, but the whales seem to be moving more slowly than what I have seen in more traditional whale watching settings. They also seem to be sticking to the surface and never dropping more than a few meters below. A giant bull passes below us raising the boat gently with the stroke of his powerful flukes and I realize that I have never seen a whale in such great detail even though this fellow did not break the surface. It’s difficult to explain but the whales seem calmer and more in their element. Perhaps when we see them in the crowded waters off of Cabo San Lucas, it is them visiting our domain, playing by our rules, living a bit outside of their comfort zone. But in Mag Bay it is we who are in their homes, so they move more comfortably with an air of calm and confidence. They seem to be more comfortable as hosts than as guests. We drift about through another few pods and then our guide slowly moves us into a small bay that we aptly name “the nursery”. We see six or seven small groupings and after a moment notice a difference. They aren’t moving. Floating like giant deadheads the only indication of life is the occasional soft “pfuuuush” and the gentle splashings from something smaller. Again, we drift until we come upon a resting female and she rises up to the surface breaking through with a gentle exhale no more than 15 feet from our panga. To me she seems smaller than what I would have expected from a mother whale. Certainly much smaller than the bull we had seen earlier and perhaps more “worn” as she was well barnacled, scarred, and had many white and grey patches throughout. Then the star of the show appeared.